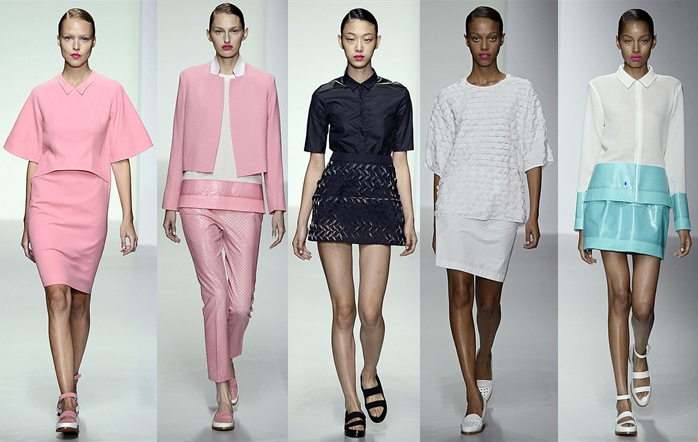 The Spring/Summer 2014 season got off to a flying start with Bora Aksu’s pretty, Turkish-inspired collection. The colour palette was inspired by an idyllic spring day, from clear blue skies to whispering clouds and buttercups in bloom. Aksu also bought in influences from his childhood, with Turkish tiling and embroidery featuring heavily throughout the collection. Fyodor Golan’s sunny SS14 collection began with simple sunshine yellows and clean fresh white, progressing to feminine pastels and bold tie-dye marbles. The duo’s focus on shape and form produced extremes in silhouettes; skin-tight, sportswear-inspired sleek aesthetics contrasting with overly feminine, billowing looks. Texture played a major part in the collection, with incredible feathers, intricate beading and pleating throughout. 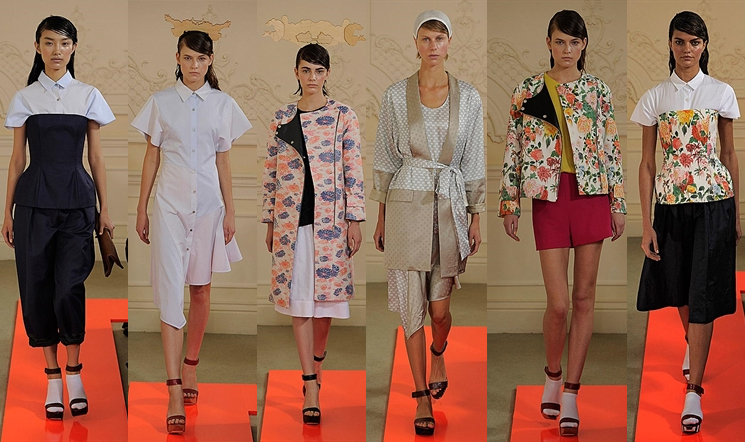 After a season in New York, Somerset House welcomed Ostwald Helgason back into the fold. It’s easy to see why the design duo behind the emerging label are making a name for themselves for modern shapes with texture and print. Upbeat prints dominated this well edited collection which featured incredible shoes from their upcoming collaboration with Aldo Rise. A cool colour palette and contrasting textures between solid matte and shimmery gloss took their cues from the irridescent jellyfish which inspired the collection, while the sports-luxe, minimalist aesthetic is J. JS Lee’s signature. Clean lines and PVC detailing create a very strong look from one of my favourite collections from day one of the spring/summer 2014 season. Eudon Choi is fast becoming one of my favourite designers on the London Fashion Week schedule and it seems I’m not the only one; despite the pouring rain the queue for his show went around the block. Dare I say it, this is Choi’s best collection to date. Inspired by the exotic flora of Asia, he took his signature masculine/feminine aesthetic and created a gentle, feminine collection with a strong focus on tailoring and garment construction. A soft colour palette of soft blush, gold and lilac with shots of crimson with those infectious prints, the entire collection is perfection. The venue for Jasper Conran’s SS14 show – the Saatchi Gallery – hinted at an artistic twist to Conran’s collection; The intricately patterned catwalk supported this notion. A typically ladylike, elegant collection from a stalwart of the London Fashion Week roster, Conran’s collection started with bright and bold pieces, giving way to wide stripes for a French Riviera feel. 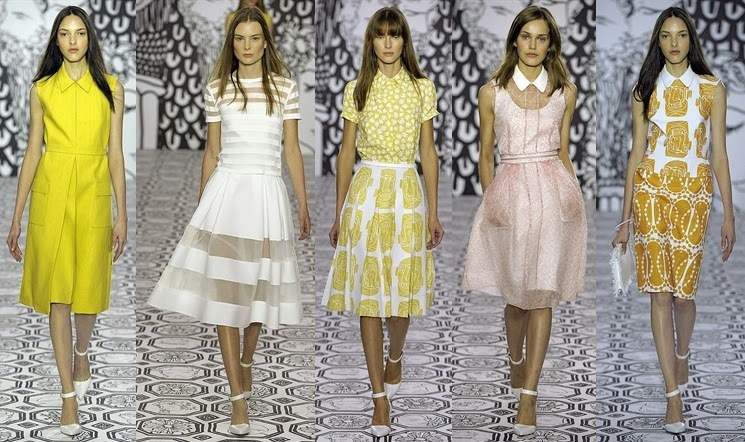 Peter Pan collars, crisp blouses and fifties-style full skirts contrasted with mismatched prints, which enthralled the front row, which included Darcey Bussell and Jasmine Guinness. Exploring the juxtaposition between self-restraint and impulse, Braganza’s SS14 collection is deliberately disjointed, with school uniform inspired sashes and skater skirts in broderie anglaise and soft pink lace contrasting sharply with tough silver leather detailing on biker jackets. Abstract prints and splashes of red added intrigue to the collection which also featured deconstructed, diagonal hems, boxy tailoring and kimono sleeves. Sports-luxe elements crept in which felt at odds with the rest of the collection and Braganza’s signature constructed tailoring. Fashion’s current mission for a 90s revival works so well for PPQ, whose super fun and playful signature is unshamedly 90s inspired. For Spring/Summer 2014, Amy and Percy raised the bar with some incredibly glamourous, whispy gowns, a bit of a surprise from a typically young, party girl label. 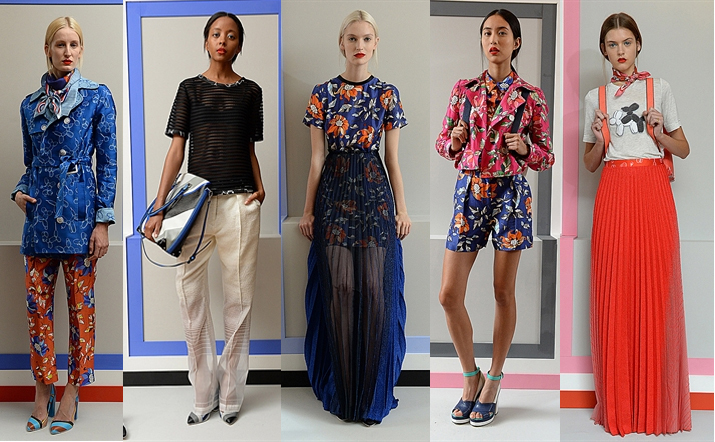 Jewel tones sit well with tropical prints and a touch of monochrome. My absolute favourite looks were those show stopping gown though, utterly obsessed.